Free breakfast and a pool are among the many highlights at the La Quinta Inn & Suites Orlando Convention Center Inn Suites. This La Quinta's 184 rooms and suites are house in a seven-story building that features a two-story atrium lobby and a landscaped courtyard. Rooms provide premium cable TV desks coffeemakers free local calls and complimentary wired Internet. Suites and select rooms have microwaves and mini-fridges. Free wireless Internet is available in the lobby. A day of meetings or theme-park fun begins with La Quinta's signature free Continental breakfast buffet of waffles hot and cold cereals bread and muffins fresh fruit and all-you-can-drink coffee and juice. The heated outdoor pool has an adjacent hot tub as well as a deck with lounge chairs. Pack your workout gear for a visit to the fitness room. The hotel also has laundry facilities and free parking. 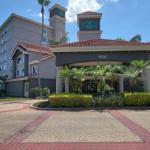 The La Quinta is just east of I-4 a 20-minute drive from Orlando International Airport and two miles north of the convention center. Universal SeaWorld and Aquatica are all within three miles of the property and Walt Disney World is about nine miles away. Dogs of all sizes are allowed. There are no additional pet fees. Dogs must be leashed and cleaned up after. Dogs must be crated if left alone in the room.